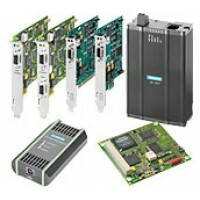 Particularly suitable for industrial use in PCs that require smaller quantity structures and for the connection of engineering software to controllers and field devices. The range of interfaces permits the ideal version to be selected depending on the application. Operation of large network configurations over high number of connections and the possibility of using multiple modules in a PC. Versions with two PROFIBUS interfaces for simultaneous master/slave operation on a card.